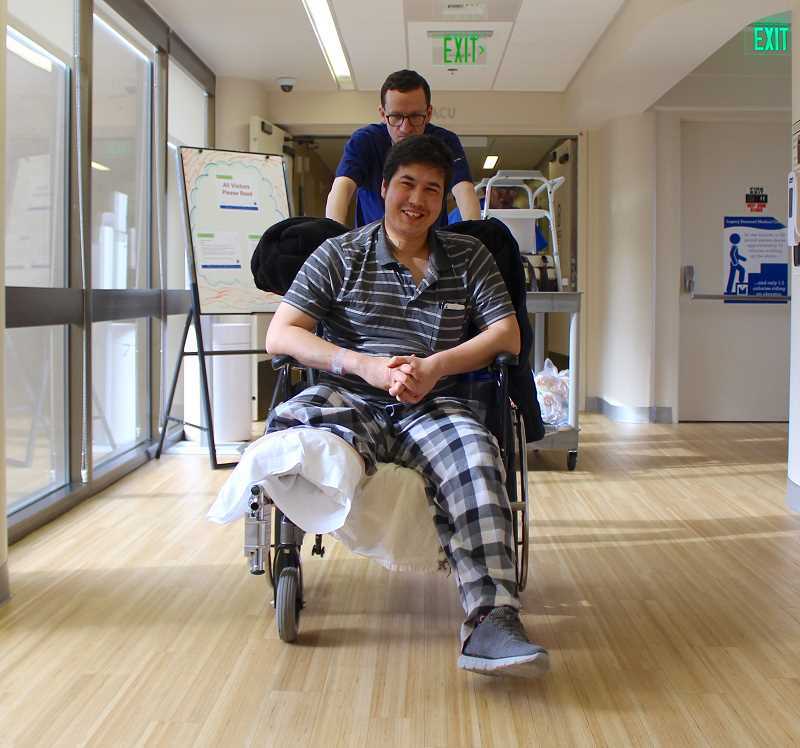 Six weeks after Mohammad Fawad Mohammadi and his family survived a brutal attack in Lincoln City that left him with a crushed leg, broken hips and a fractured spine, the Palisades Market employee is finally able to recover in the comfort and quiet of his Aloha home. "It's great to be with my wife and my son. It's going really good, I think," Mohammadi told The Review this week. "The care I've been given was great. Doctors and nurses were there when I needed them, and I was really happy with it." 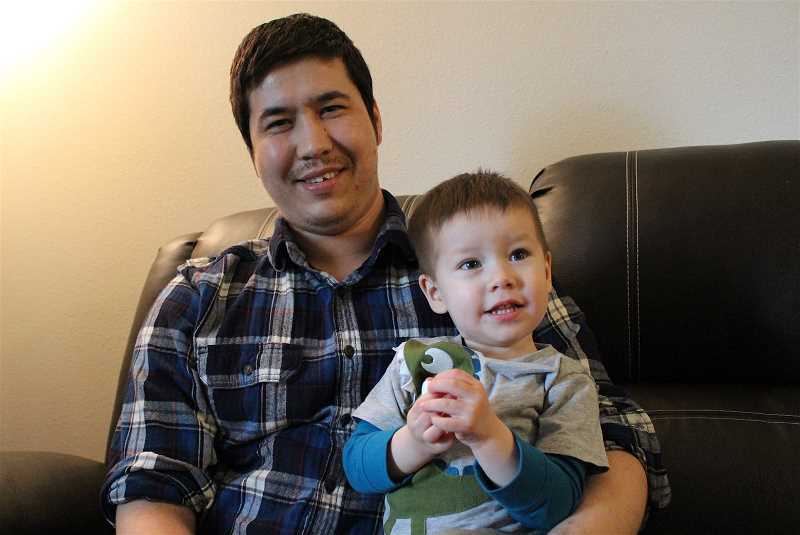 Mohammadi was visiting the Oregon coast with his family on March 6 when they were involved in a minor traffic accident while leaving the parking lot of a Walgreens on Highway 101 in Lincoln City. When he and his wife exited their vehicle to assess the damage and exchange insurance information, the other driver put his car in reverse and drove toward the couple. Mohammadi was able to push his wife to safety, but he was struck by the vehicle and pinned between the two cars. He was quickly flown by Life Flight helicopter to Legacy Emanuel Medical Center in Portland, where he spent time in and out of the Intensive Care Unit. He underwent a series of surgeries, including one in which doctors were forced to amputate his right leg about 6 inches below the knee, and battled an infection that slowed the healing process. He was finally released from the hospital on April 12. The alleged assailant, Perry G. Nicolopoulos, 68, of Puyallup, Wash., was arrested a short time after the crash. He now faces 12 felony counts — including attempted murder — and four misdemeanors, and is being held on $1 million bail until an April 30 court date. Officials have asserted that Nicolopoulos was motivated by bias; enhancements to the 16-count indictment would result in a harsher punishment should he be found guilty. Mohammadi says it's hard not to think about what motivated his attacker, and what was going through his mind when he attempted to crush Mohammadi between their cars. ing and why did he do this to me?" As harrowing as the attack was, Mohammadi remains positive. He says he understands that there are bad people in the world, just as there are many good people. He even saw the bright side when doctors were forced to amputate part of his leg — they were able to save his knee, he says, which means learning to use a prosthetic will be much easier. He says he has his family to thank for keeping him optimistic. "(My positivity) comes from family. You have to stay strong for your family because you're not the only one that you have to care for," Mohammadi says. "You have other people to care for, and that's my family, both here and back home." Mohammadi didn't reach out to his family in Kabul, Afghanistan, after the attack for fear they would worry about him. But they found out anyway, he says, after a cousin saw a photo on a Facebook page. The photo had been taken by U.S. Rep. Earl Blumenauer while he was visiting Mohammadi in the hospital; now, Mohammadi says, Blumenauer is working with his family to help them visit the United States while he recovers. Since returning home from the hospital, Mohammadi has had plenty of visitors, including friends, family and media looking to hear his story and wish him well. He's not at full strength yet, he says, but he wants to be able to talk to everyone who takes the time to see him, particularly his Afghan friends in the area who have become like an extended family to him and his wife. "There isn't a lot of us, about 30 families, but these 30 families are like me, they have served in the Army like me, with similar backgrounds," he says. That familiarity provides a strong bond, especially considering that Mohammadi's work as a translator for the U.S. military put a Taliban target on his head. He remembers when he first told his family he was becoming a translator and would be working in the ultra-violent Kandahar Province. "When I started working with the U.S. military, my family wasn't happy because of how dangerous the battlefield is; both Kandahar and Helmand Province are very dangerous," he says. "When I told them I was going to serve in Kandahar, they were like, 'Um, no.' We had a big fight." Mohammadi served with American troops for four years before coming to the U.S. on a military visa. He says he and his wife were in search of a place that was safer than the life they left behind, and up until the March 6 attack, it seemed they had found it. Shortly after arriving, Mohammadi found work at Bale's Farmington Marketplace and made a lifelong friend in his supervisor, Laurie Boss. Boss took him under his wing and still treats him like a little brother. He was there when Mohammadi bought his first car, and even showed him how to change a tire and check the oil. When Boss transferred to Palisades Market in Lake Oswego. he took Mohammadi with him. "He's just such a positive guy," Boss says. "If you were going to find someone representative of the Muslim people, it would be him." Mohammadi quickly became somewhat of a fixture in the deli at Palisades Market, where he earned the affectionate nickname "Soup King" for his creative recipes. So when the store's employees and customers learned about his injuries, they immediately came to his aid. As of Wednesday, the GoFundMe account they started at bit.ly/FawadsFund had raised more than $105,000 toward a goal of $150,000, with contributions from more than 1,800 people. Additional funds have also been raised through checkstand donations at the grocery store. For now, Mohammadi is focusing on his recovery and spending time with his family. He's happy to be at home, even if he is now forced to deal with navigating life as an amputee. Just this week, a Metro West representative visited his home to discuss ways to improve his mobility around the house. While it will take some getting used to, Mohammadi says, he is still optimistic about his future. "I want to go back to school. I was studying at PCC, but I didn't take any classes for spring because of this situation, so I might go back," he says. "I'm interested in nursing." Moving forward, he says, he would like people who hear his story and are facing their own hardships to take away just two pieces of advice. "They should stay positive and not let anything stop them from what they want to do in life," Mohammadi says." They should care about the people around them too. It's not like it's only you that goes through a hard time when you have a traumatic experience. The people around you are important, and that's something you need to think about."